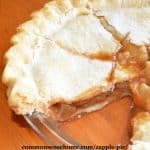 This mock apple pie is made with overgrown zucchini or summer squash. It’s so close to the real deal that your family may not believe you when you tell them it’s zucchini. Prepare pie dough by mixing together flour and salt. Cut in fat using a food processor or pie blender until mixture resembles course crumbs. Gently sprinkle water over flour mixture and stir together until dough holds shape. Do not overmix. Flatten into two disks and refrigerate. If you haven’t already done so, fillet your zucchini. Slices should be about 1/8 – 1/4 inch thick. Combine the zucchini and lemon juice in a medium saucepan. Bring to a boil. Reduce the heat and cook, stirring occasionally, until the zucchini starts to soften, about 5 minutes. Add the sugar, cinnamon, ginger and nutmeg and simmer for 5 minutes longer. Remove zucchini from heat. Stir in tapioca and let stand for 15 minutes. Preheat oven to 425°F and place a rack in the lower third of the oven. While zucchini is resting, roll out pie crust. I prefer to roll out my pie crust on lightly floured wax paper so it is easier to move around. Place bottom crust in 9 inch pie plate. Cut small slits in top crust for steam to escape (or wait to cut slits until after the crust is on the pie). Spoon zucchini filling into bottom crust. Place top crust and crimp edges. If you didn’t cut slits earlier, cut them now. Place pie on rack in lower third of oven. Use pie drip pan and pie crust shield if desired. Bake for 20 minutes. Reduce heat to 350°F and bake for 30 minutes more. Sprinkle top of pie with reserved sugar. Bake for 10 to 15 minutes, more, until crust is golden and the juices are bubbling through the slits. Remove pie from oven and cool on wire rack.